According to the Federal Aviation Administration (FAA), some 2.6 million passengers fly in and out of U.S. airports on 43,000 scheduled flights on any given day of the year. And while air transport is a safe, fast and affordable way to travel, the large volume of commercial passengers who pass through airports each day is a stark reminder of the daunting task security professionals routinely face. The U.S. government has implemented comprehensive terrorist screening protocols, which prohibit certain persons of interest from air travel. Despite these extensive measures, it is still possible for suspects to slip through the cracks in traditional airport security, resulting in their fleeing the country or posing a safety risk to other passengers. Facial recognition technology enables operators to leverage an airport’s existing video surveillance infrastructure to more effectively pinpoint persons of interest. Users can compile watchlists by extracting digital images from video or from other sources. Referencing these images, a video content analytics system can drive accurate face matching, detecting and identifying appearances of the same (or similar) faces to those on the watchlist. This can help accelerate post-event investigation — enabling rapid video review for pinpointing suspects — and also real-time apprehension of suspects by configuring alerts to trigger calls to action when persons of interest are detected. Aside from enhancing security, face recognition technology can also improve an airport’s operational efficiency. Delta Air Lines has launched Delta Biometrics for international travelers, which leverages facial recognition to verify traveler identity at every checkpoint from the check-in curb to the gate, thereby streamlining baggage check, security screening and boarding processes. More airlines and airports are likely to follow in the future. In terms of efficiency, biometric methods are reshaping the airport experience for the traveler. Another way airports can streamline the experience is by complementing physical identification with unique biometric IDs — from face to fingerprint scanning. When travelers consent, biometric IDs can be stored in the cloud and used to verify the passenger’s identity at various airport checkpoints. Unlike conventional IDs, a biometric one cannot be duplicated, helping lead to a safer, more secure and better-streamlined airport. Iris scans in particular are emerging as a way for airports to verify the identity and credentials of international travelers. While this technology isn’t likely to replace customs officials or the conventional passport, it can help confirm the identity of international travelers and help countries better track just who is flying into their airports. It can also help curb passport fraud. According to Forbes, nearly 80 percent of airports and more than 70 percent of airlines are considering implementing biometric options, so it’s only a matter of time before this technology becomes the norm and not the exception. With biometric technology increasing airport security and enhancing operational efficiency, it’s easy to see why. 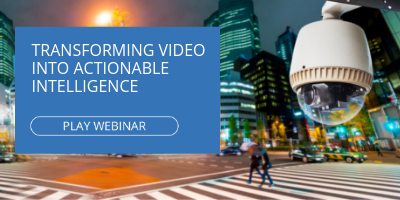 If you’d like to see more about how BriefCam’s technology can enhance operations at your business or airport, watch our free webinar by clicking the image below.